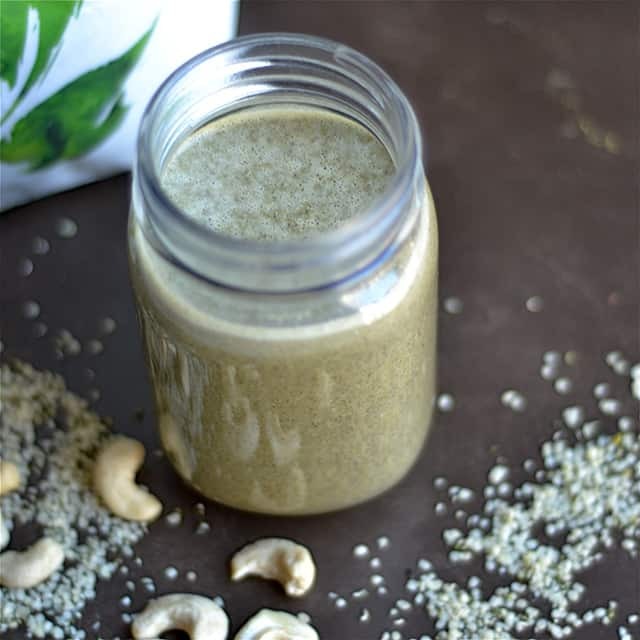 This simple Cashew Hemp Protein Smoothie is a perfect tasty drink for those busy mornings when you need an “on-the-go” meal! 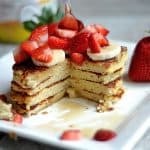 Hey friends, today I’m sharing with you the ONE meal my husband has each and everyday of his life. Yep, never goes a day without it (unless he’s traveling). I have it just about everyday too, but mix it up as a breakfast or snack. So what makes this smoothie so special that we drink it EVERYDAY???? Here is the best answer I can come up with. It’s very tasty, super easy, filling, and gives us lots of energy. As some of you may know, I don’t drink coffee. Gasp. It has nothing to do with me having a problem with coffee or being opposed to coffee, I just don’t like it. Plain and simple. I love the smell, and I love coffee flavored things (like coffee + chocolate makes me very happy). I hope we can still be friends. But…….Where was I going with this? Oh yeah, I use food as my fuel to give me energy. I love kombucha, tea, and green juice for energy too, but that’s another story……. 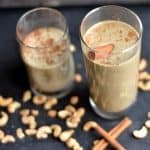 This smoothie does the trick on providing me with plenty of energy, and is so nutrient dense it’s like drinking a vitamin. On the surface it may sound a little bland or not that exciting, but I can assure you I look forward to it everyday! And so does my husband. We are people who love food and live to eat! I am seriously not choking down something that doesn’t taste super yummy. So now we can talk about the easy part. Only 4 ingredients (I add in 2 more optional ingredients that I will share in a minute). 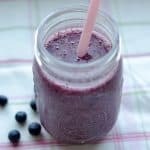 So even when you’re running out the door already late for whatever, you can easily toss this in the blender and have breakfast ready in less than 1 minute. 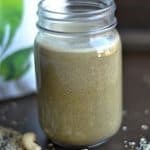 These 4 ingredients include Hemp Protein powder, cashew butter, your favorite nut milk (I love flax milk and use unsweetened for Paleo and Whole30 approved), and a banana. That’s it!! 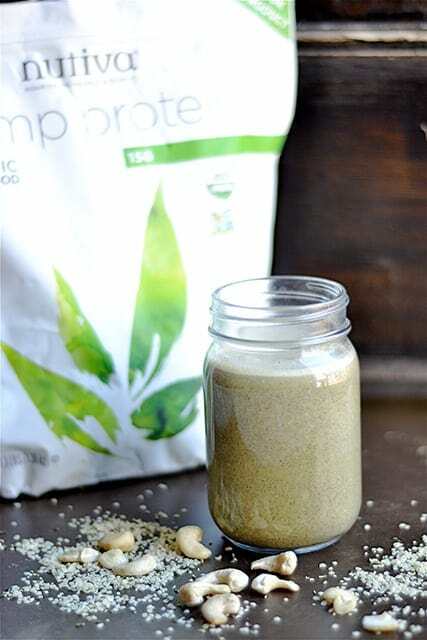 I should also make a HUGE deal about the nutrition in Hemp Protein Powder. First of all, it has 1 ingredient: hemp protein. It’s FULL of magnesium, zinc, and probably the best possible source of plant based protein. These are often low in a standard diet, so drink up!! So now on to the taste. Since I’m giving you small tidbits about my life, now would be the time to tell you that I don’t like anything sweet in the mornings (or sweet drinks in general). 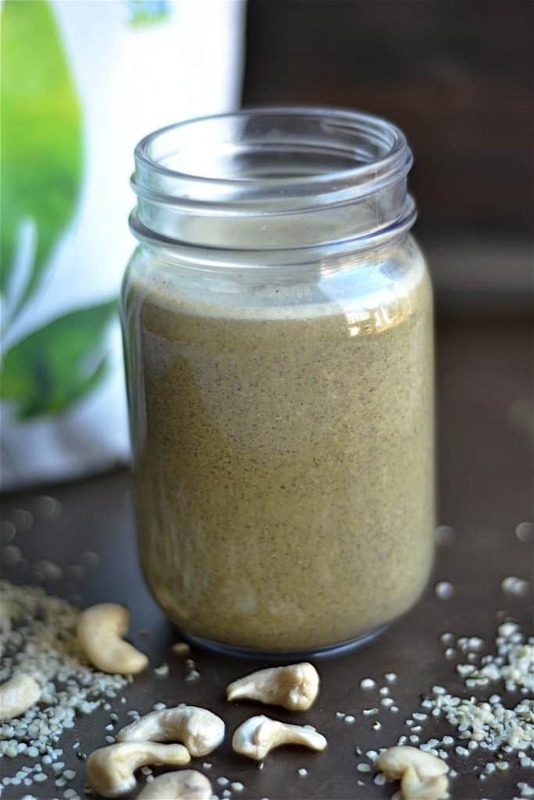 This is not a sweet smoothie, it’s has a nutty and gritty flavor from the protein & cashew butter, but the powder is very neutral tasting. The banana provides you with all the sweetness you need! And use a browner banana for the sweetest variation possible. Now back to those optional ingredients. Remember when I told you about loving coffee flavored things? I love to put in a few tsp of instant coffee to give it a bitter coffee taste. Sometimes the husband drops in a shot of espresso. It sure adds great flavor!! I also add in hemp seeds for additional texture and thickness. I hope you enjoy, and keep these simple ingredients on hand! 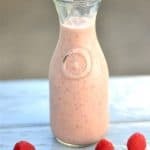 Mix ingredients into a blender and blend about 5-10 seconds until smooth. If you like a sweeter variation, you can use sweetened milk. But, use unsweetened if following a sugar-free diet. I don’t believe in using protein powders….have you ever made this just using hemp seeds instead?? Hi Carol, I use hemp protein which is just ground hemp. So essentially you could add in more hemp seeds and it would have a similar effect. But I am also like you and don’t prefer protein powders. Hemp protein is my one exception!